Blobmosis interview - ADW talk radio. MOST IMPORTANTLY - for good reasons spam filters are pretty sensitive, OCCASIONALLY Blobmosis messages end up in the spam/trash folder - make sure you go look for them and dig them out. Copyright © 1998-2012. All rights reserved. Reproduction strictly prohibited. All comments are moderated. Seems that anyone with something to sell tries to get on to website in the name of spam. I hate spam. Rest assured though if you have a genuine comment, it'll be up in no time. Click any of the links, of course, you can sample it at all the sites before buying. So I've been interviewed for ADW Talk radio - click here, and listen to me blather on. 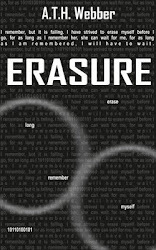 Erasure - out right now. Click on the erasure banner to be taken to the facebook page, all links are there! Indie Authors need all the help they can get. Copyright Blobmosis 2012. Simple theme. Powered by Blogger.